EULESS, Texas, Sept. 5, 2018 -- U.S. Concrete, Inc. (NASDAQ: USCR) ("U.S. Concrete" or the "Company"), a leading national supplier of ready-mixed concrete and aggregates, today announced that its wholly owned subsidiary, Polaris Materials ("Polaris"), has obtained the necessary permits to increase the amount of aggregates it imports at its terminal located in Long Beach, California. As a result of the new permit, Polaris is now able to deliver up to two million tons of highly specified aggregates annually, effectively doubling its throughput capacity in supply-constrained Southern California. 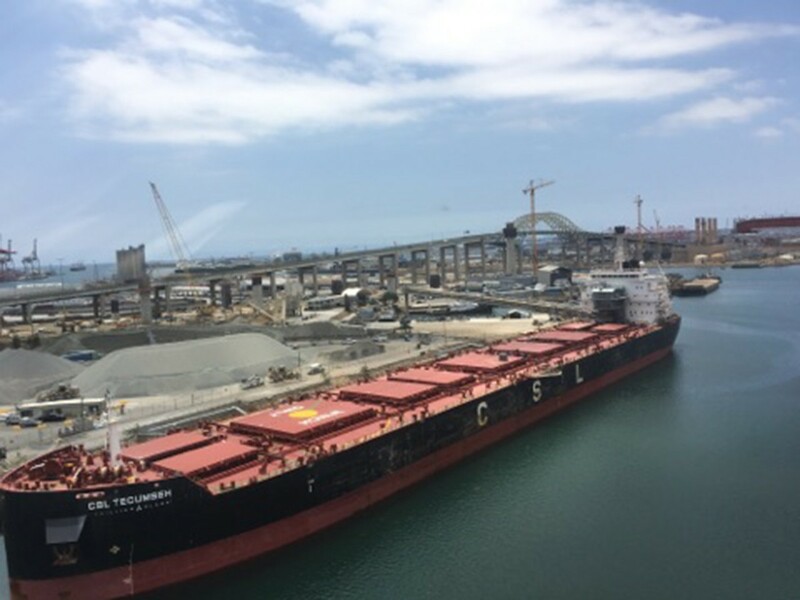 "We are very pleased to be able to expand the aggregates throughput at our Long Beach terminal, especially at a point in time where the demand for these materials in Southern California is at an all-time high," said William J. Sandbrook, Chairman, President and CEO of U.S. Concrete. "Our intention was for the Polaris acquisition to grow its aggregates volumes to provide our shareholders with both immediate and long-term value. The permit helps with these objectives, while also positioning our Company to benefit from the anticipated tailwinds for the market, including the 2028 Olympics in Los Angeles." U.S. Concrete acquired the Long Beach Terminal as part of its acquisition of Polaris in November 2017, which marked its entry into the Southern California market. By increasing its aggregates permitted volume, the Company can expand its project capacity and scope, and improve its ability to serve the market. U.S. Concrete, Inc. (NASDAQ: USCR) is a leading supplier of concrete and aggregates for large-scale commercial, residential and infrastructure projects in high-growth markets across the country. The Company holds leading market positions in New York, Philadelphia, San Francisco, Dallas-Fort Worth and Washington, D.C, and its materials have been used in some of the most complex and highly specialized construction projects of the last decade. U.S. Concrete has continued to grow organically and through a series of strategic acquisitions of independent producers in our target markets. For more information on U.S. Concrete, visit www.us-concrete.com. This press release contains various forward-looking statements and information that are based on management's beliefs, as well as assumptions made by and information currently available to management. These forward-looking statements speak only as of the date of this press release. The Company disclaims any obligation to update these statements and cautions you not to rely unduly on them. Forward-looking information includes, but is not limited to, statements regarding: the expansion of the business; the opportunities and results of our acquisitions; the prospects for growth in new and existing markets; encouraging nature of volume and pricing increases; the business levels of our existing markets; ready-mixed concrete backlog; ability to maintain our cost structure and monitor fixed costs; ability to maximize liquidity, manage variable costs, control capital spending and monitor working capital usage; and the adequacy of current liquidity. Although U.S. Concrete believes that the expectations reflected in such forward-looking statements are reasonable, it can give no assurance that those expectations will prove to have been correct. Such statements are subject to certain risks, uncertainties and assumptions, including, among other matters: general and regional economic conditions; the level of activity in the construction industry; the ability of U.S. Concrete to complete acquisitions and to effectively integrate the operations of acquired companies; development of adequate management infrastructure; departure of key personnel; access to labor; union disruption; competitive factors; government regulations; exposure to environmental and other liabilities; the cyclical and seasonal nature of U.S. Concrete's business; adverse weather conditions; the availability and pricing of raw materials; the availability of refinancing alternatives; results of litigation; and general risks related to the industry and markets in which U.S. Concrete operates. Should one or more of these risks materialize, or should underlying assumptions prove incorrect, actual results or outcomes may vary materially from those expected. These risks, as well as others, are discussed in greater detail in U.S. Concrete's filings with the Securities and Exchange Commission, including U.S. Concrete'sAnnual Report on Form 10-K for the year ended December 31, 2017.